IceDragon security indicators are shown in the website address bar and tell you about the safety of the connection between you and the website you are visiting. Transport Layer Security (TLS) and Secure Sockets Layer (SSL) are protocols which encrypt the connection between your internet browser and the web site you are visiting. All data passed over an SSL/TLS connection is encrypted, so it cannot be deciphered or understood by anybody who intercepts the communication. This prevents sensitive data like credit card numbers and passwords from being stolen by hackers. A website can implement encryption by installing an SSL/TLS certificate on their web server. Websites protected with an SSL/TLS certificate will show a lock icon in the browser address bar. 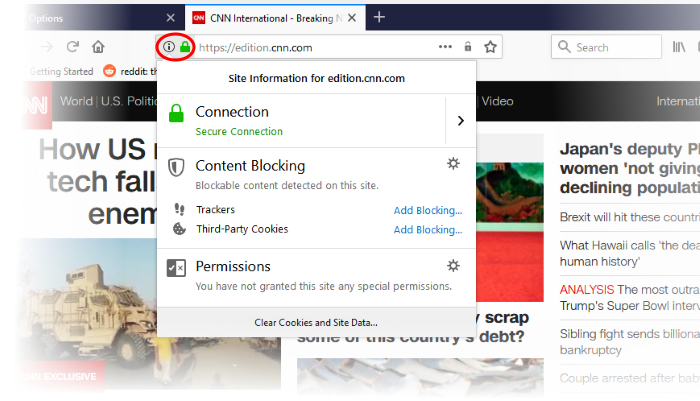 The connection to the site is insecure. It does not have a TLS/SSL certificate installed. Do not submit confidential information or enter your username password to an insecure site. The green lock appears when IceDragon establishes a secure connection to a web site. Your connection to the site is encrypted. The page contains some insecure content. Even if a site has a certificate installed, you will see this error if the page loads images or other content from an insecure site. The page hosts dangerous content or has an invalid certificate. The 'Control Central' pane displays the current connection to the site. Click the right arrow on the Control Center to view the identity information of a certificate, the website's owner, and change settings for the site that you are currently visit. TContent blocking indicates whether or not a page contains elements that track you. See Block Websites From Tracking Your Browsing Activities for more detailed information. Permissions indicates any permissions you have set to the website. You can remove permission from the Control Center. You can also manage items available from the 'Permissions' under the 'Privacy & security' section. See View and Manage Permission Settings for more details.